One Visa files suit against TM : Is it a Human Rights abuse? The Star today reported that a company called One Visa is suing Telekom Malaysia (TM) for providing telecom services and infrastructure to squatters on it’s land in Negeri Sembilan. TM was alleged to have trespassed five pieces of One Visa’s land by supplying the telco services to the illegal occupiers of its land. One Visa had sought RM23.07mil as special damages being the total rental value of the land based on current market value rates calculated from March 22, 2011 and continuing until cessation of the telco services and the date of removal of TM’s infrastructure from the land. That’s right 23.07mil in ‘special’ damages for the TOTAL rental value of the land, because TM had supplied telco services to the illegal occupiers. Now, I’m no lawyer and I’m not familiar with the case, So I cannot comment on the legality (or illegality) of the squatters staying on the land. What I can comment on though is the utter ridiculousness of the suit to sue TM for the full rental of the land just because TM had supplied telco services. That’s like charging your neighbour rental for your entire house value, just because his mango tree has over-grown into your garden. I’m obviously not TMs biggest fan, and although I really like my Unifi connection, this has nothing to do with how I feel about TM. This has everything to do with how I feel about technology. What One Visa hope to achieve in their suit against TM is to scare the living daylights out of every single service provider from giving these squatters anything–so that you won’t even think of going into this place for whatever reason. What does this have to technology? Everything. Back home in Malaysia, we have services like MyEG and E-Filing for taxes which is part of the government strategy to move more government services online, fully leveraging on the scale that the internet can offer. You can’t offer these online services without having a proper framework to provide Malaysian Citizens (even non-Citizens) with some basic telecommunications infrastructure. No point talking about E-filing if 50% of your population can’t access it because they have no internet communication. 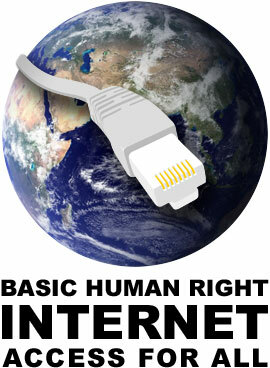 Broadband can be seen, not just as a basic Human Right, but also as the enabler to other basic rights. We see things like food and shelter, and even medication can leverage on a telecommunications infrastructure for more efficient delivery. If we then turn around and say, that some people (like squatters) don’t deserve broadband, that is tantamount to saying that they don’t deserve basic human rights–that somehow, they’re less human. I’m not commenting on the case, or the legality of the squatters, but even squatters deserve all the basic human rights, and that includes broadband connectivity. Shame on One Visa for threatening TM into submission. TM is a private entity, but it is also a Government Linked Company and has a responsibility to the nation as a telecom provider. It shouldn’t kow-tow to this scare tactic and should go all the way in court and then some. More importantly, if One Visa has a problem with the squatters, it should take it up with the squatters not TM. If TM can be successfully sued for providing what is basic Human Right to Malaysians this could be a slippery slope we’re walking here. This is the one time, I’m fully supported Telekom Malaysia all the way. It’s only a matter of time, before we start seeing public education leverage on telecommunication services like broadband connectivity to provide a more effective delivery, particularly to rural schools, and all of that would run on the public communications infrastructure. To deny someone that infrastructure, is to deny them equal access to services that they have every right to receive. One Visa is acting like a school-yard bully, who instead of just bullying one poor kid, is also targeting all his friends–this serves to alienate the kid even more. We should always stand up towards bullies and never let them terrorize us into submission. TM has duly complied with the above judgment. OVSB did not file any appeal within the period prescribed by the law. The Directors, based on legal advice, are of the view that the legal suit has ended.